A new freedom in the living room. Now the professional can explore new challenges and creativity without compromising the integrity and health of hair. Strengthens the internal bridges and structural bonds of the hair. Drastically reduces hair breakage in chemical processes: discoloration, clarification and coloration. Protects hair hair fiber from possible damage caused by chemical processes. 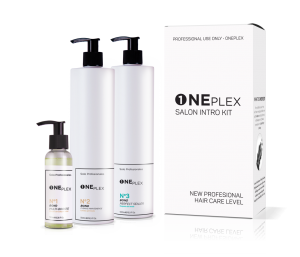 Add 3,75ml (3 pulses) of ONEplex Bond multi-booster Nº1 (100ml), in the mixture of each coloring or bleaching service (the amounts of dye or bleach of the brand used are maintained). Add ONEplex multi-booster # 1 in the bowl along with service preparation. Optimize the effect by washing the hair with Bond Clean & Maintenance (500ml) with a gentle massage. Leave on for 3 minutes and rinse. After the hair rinsing process, apply approximately 5ml (depending on hair) of ONEplex Bond Sealer Nº2 (500ml) with a light massage, leave to act 5 minutes and rinse.